Image caption "Sharenting" - harmless fun or an invasion of privacy? And - if you want to - how do you convince them to take the photos down? "Sharenting" - the act of parents sharing news and pictures of their kids online - is in the news after Gwyneth Paltrow posted a picture of her and her 14-year-old daughter Apple Martin skiing. More than 150,000 people liked the picture, but Apple wasn't so impressed, writing (from her private Instagram account): "Mom we have discussed this. You may not post anything without my consent." Many of Paltrow's fans have argued that, as the mother, she had every right to share pictures of her daughter - but others say children deserve a right to privacy too. Why do people find 'sharenting' upsetting? Ironically, children aren't technically allowed to register with most social media services until they are 13 anyway - which means some rule-abiding teenagers get a shock when they finally get online. 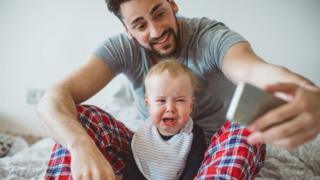 Konrad Iturbe, a 19-year-old software developer in Spain, told the BBC he had a "big awakening" when he realised his parents had been posting photos of him online. Image caption Konrad: "Back in the day, pictures disappeared, but now everything is online and it stays forever"
"I really don't like photos of me online anyway - I don't even post photos of myself on my Instagram account - so when I followed my mother and saw them on her profile, I told her to 'take this down, I've not given you permission'." Konrad says his mother understood his concerns and acted quickly to deal with the issue - as he says all parents should. He says discovering the pictures it felt like a "breach of privacy". It particularly bothered him because there were photos of him as a young child, and his mother's Instagram account was open to the public. "I didn't want photos of my youth shared, it's a very intimate thing," he says, adding that he is also worried about "facial recognition algorithms" and people being able to "start tracing me when I'm older". Will our online lives soon become 'private' again? Writing in Fast Company magazine, she says: "When I saw the pictures that she [her mother] had been posting on Facebook for years, I felt utterly embarrassed, and deeply betrayed. "There, for anyone to see on her public Facebook account, were all of the embarrassing moments from my childhood: the letter I wrote to the tooth fairy when I was five years old, pictures of me crying when I was a toddler, and even vacation pictures of me when I was 12 and 13 that I had no knowledge of." Not everyone minds "sharenting", however. Charlotte Christy, a 23-year-old studying in London, says she personally thinks it's "quite normal". She was 13 when her mum started uploading photos of her on Facebook. "She would tag me and it would be on my news feed so everyone could see it. I thought it was embarrassing, but I wasn't upset to the point of asking her to remove it." "I feel like we live in a society where everyone wants their photos to be really flattering - but if my mum posts an unflattering photo of me it doesn't really bother me." "I think I share photos of my mum just as much as she shares photos of me - I think it's a natural thing to share and I don't see why she should ask for my permission - she's my mum." "When I was 21, my mum tagged me on Facebook, and I saw that she'd posted a bunch of photos of me - from when I was a baby to me in my 20s," she told the BBC. "Her settings were public, so I just found it very unsafe. I didn't want my baby photos leaked to everyone, and I knew that with Google, you can search for someone's name using their photos. And by her contributing more photos of me online, technology companies have more data on how I look." Andra Siibak, a professor in media studies at the University of Tartu in Estonia, has conducted several studies into "sharenting". In one study involving Estonian children aged nine to 13, she found that children liked "parents sharing positive things about them", but that "there were big discrepancies between what children and parents considered to be nice photos". "Children were not in favour of parents sharing unflattering visuals of them - for example, if their hair was messed up or they were wearing a dress they didn't actually like." "In many contexts the parents would not consider those things to be a big problem, but for the pre-teens this could affect their self-image" or potentially lead to cyber-bullying. Another potential risk from "sharenting" is "digital kidnapping", Prof Siibak says, where strangers take publicly available photos of children, and use them for fraudulent or sexual purposes. Should parents take their children's concerns more seriously? Prof Siibak says many parents feel that, as the adult, they are responsible for their child's wellbeing, and don't need their child's permission as long as they believe the photos are not doing any harm. However, she argues that parents should "absolutely" take their children's privacy concerns more seriously. "Just having a simple discussion that involves children on what kind of photos they like, and if it's ok to upload them, helps build a better parent-child relationship." Parents often set strict internet usage rules for their children to protect their privacy, but the "rules only seem applicable to children, and not adults in the family". Both Konrad and Sarah say their parents initially dismissed their concerns - partly due to a lack of understanding about internet privacy. "At first my mum laughed and said, 'nobody's going to see it - it's just for friends', even though her Instagram profile was open to everyone," says Konrad. Eventually, after he explained his privacy concerns to her, she understood, and now asks his permission before posting. Meanwhile, Sarah says when she told her mum to change her privacy settings, her mum was "quite offended at first". "She said she was proud of me and wanted to share things about me online... when I tried to explain [my privacy concerns] she didn't understand and said 'everything is being monitored online anyway'." "I don't think many parents understand cyber security quite as well as we would, because their generation was born without the internet." Eventually, Sarah says her mother did agree to change her privacy settings to "friends only", although "she's got more than 1,000 Facebook friends and most of them she doesn't actually know - so in a way that's still quite public!" "After she tagged me, I also started getting friend requests from her friends as well. I immediately declined." "Thank God she doesn't know how to use Instagram yet." It's complicated - especially as there's no way of physically or legally stopping them from posting. Often it comes down to persuasion - or compromise. "I'd say - how would you feel if my grandparents posted pictures of you doing embarrassing things on the front of a newspaper? Back in the day, pictures disappeared, but now everything is online and it stays forever." Meanwhile, Sarah says: "I found it better to stick to the facts and not get emotional about it. "When I used emotions - telling my mum I looked horrible in the baby photos, or that I felt the photos were indecent because I wasn't fully clothed - she'd say, 'but people will just find it cute'. "Whereas if I explained the facts about internet security, and how we didn't know what people would do with those photos, my mum agreed to be more careful." Her mum still posts photos without her permission, but Sarah sees her mum's improved privacy settings as a reasonable compromise - and she's also found her own workaround. "Basically, I've changed my own privacy settings so my friends can't see the photos my mum has tagged me in." She also acknowledges that, for many parents, sharing photos of their children is a way of "expressing their love". "It's a way for them to show how much they miss their kids [if they don't live together] - that's one of the main reasons why I decided not to completely stop her." What is 'Sharenting' and should we be doing it?